To make your website and Joomla work properly, you need a server with a PHP version 5.2.4 or later with a MySQL database version 5.0.4 or later. All packages that can be found in our offer meet those requirements. At the beginning, create a new account on www.internetum.com. 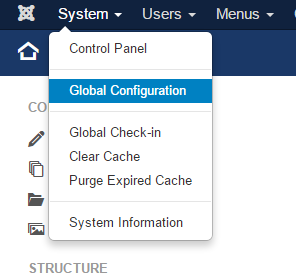 As soon as you order your server, you can easily log in to your User Panel where you can install Joomla. At the bottom of the dashboard you will find a section related to software installation for a website. Today we will focus on Joomla installation. By using only the User Panel you can install many available web applications – not only CMSes, but also forums and blogging platforms. Click on „See more” to go to the next step. 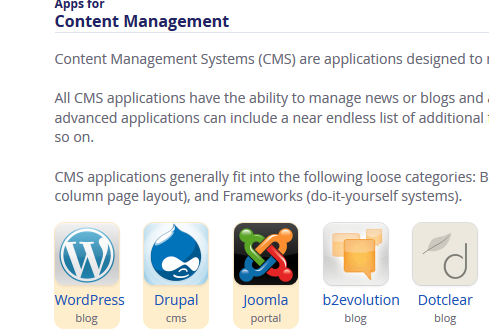 Find Joomla in “Applications for Content Management System”. Click on the Joomla icon. 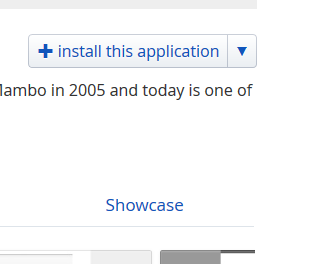 Go to the next page and click on the „Install this application” button. Integrated with cPanel Installatron will let you install the latest version of your software. You can configure Joomla on the next page. In this section you should set a domain, under which your blog will be available. The default domain here is a domain assigned to your account. The path allows you to determinate whether your blog should be available under another URL, for example test.com/blog/., or not. 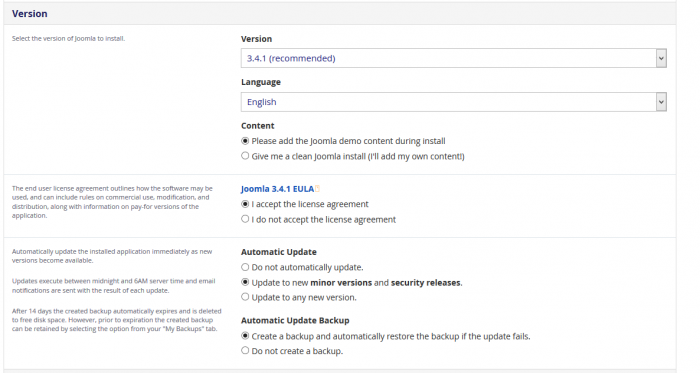 In this section you can choose the Joomla version that you want to install. You should also choose automatic updates. The default version is the latest available version and you should rather not change it unless you have a good reason. Language defines a language your website will be available in. Additionally, you can decide if you want to make installation complete with examples of blog elements, so you can see what everything looks like in action. It is a very good option if you want to make sure that Joomla meets your needs. Of course, you must confirm that you know and accept the Joomla Terms and Conditions. The other settings should rather stay unmodified. Automatic actualizations are very important. Internetum does everything to offer an opportunity to restore the backup. In this section you can set elements related to the main account (so-called Admin account). You must, of course, choose your user name and password. Remember to make your password difficult to guess. You can use passwords that have already been generated by the panel. They meet all the strict requirements, so they are very difficult to guess. The Page Tittle is a text that users will see in a tab of their browsers and in a header of your website. An email address connects users with you. All questions and messages from them will be forwarded to the email address you have set. Here you can configure options for more advanced users. A longer description will appear shortly. When you go through all the settings, you can proceed to install Joomla. When the installation is complete, you can continue configuring Joomla in the administration panel. When you click on the link above, you will be asked to log in to your account by providing your login details. Once you are logged in, you will see your admin panel. 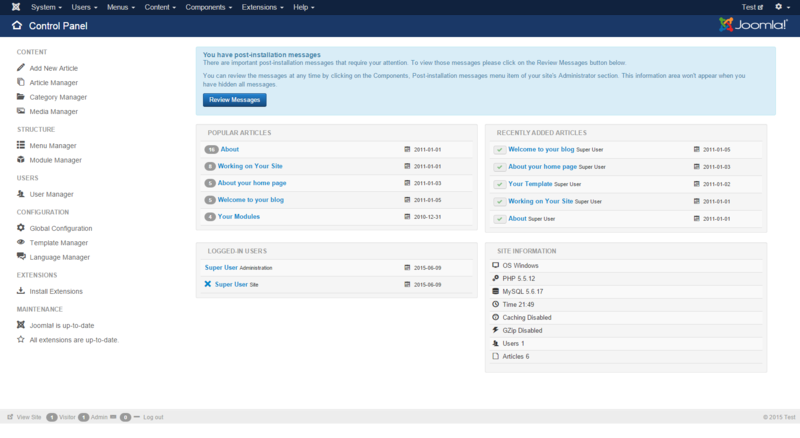 In the administrator panel you can manage the whole website, for example posts, users, plugins, etc. Here you can set up everything that is visible on your website. This will be your most frequently visited part of the panel. Here you can create entries, edit them, assign categories, save drafts, hide entries, add tags, etc. 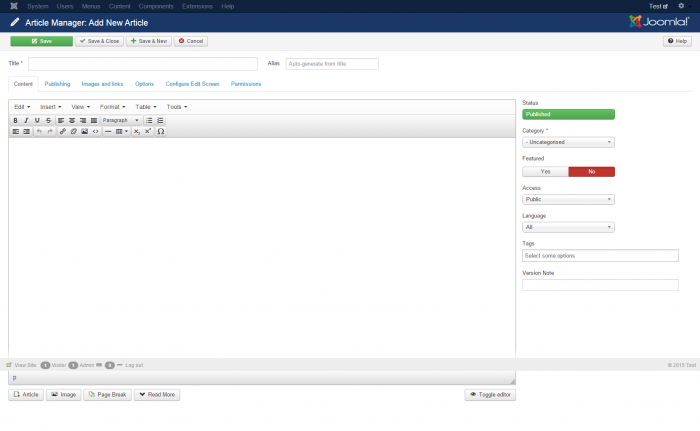 The Joomla entries editor gives you many options even though it may seem complicated at the beginning. The „Title” field allows you to enter the title of your entry. Under it, you can see there menu where you can switch between categories related to the entry you are creating, its publication, or used pictures. The Joomla editor is a WYSIWYG editor. Use the available formatting options to change text colour, font size, etc. Here you can save your entry, save and close it, save and open a new entry, or cancel all changes that you have created in your entry. 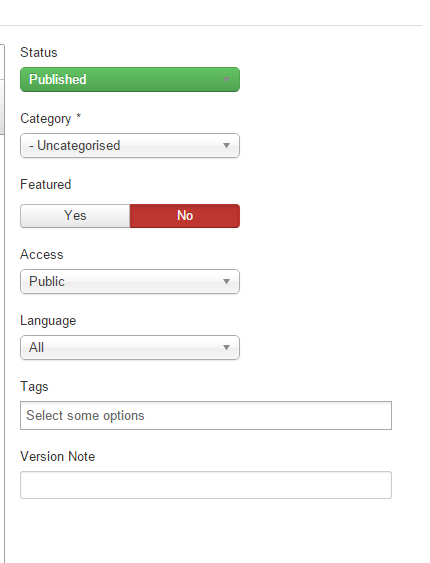 Here you can publish your entry, assign it to categories, set the access options, and add tags. 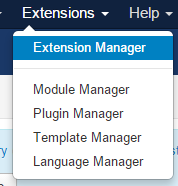 Joomla does not have a template central management system. This is why you should visit http://www.joomland.org in order to find the most suitable template for yourself. When you have already chosen your template, download it. Find „Extensions” and „Extension Manager” in the top menu. With the use of the tool that will load first, select the template file that you have just downloaded. Your template will start being installed. 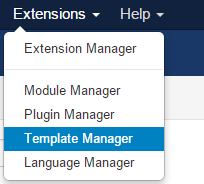 In order to activate your new template, use the top menu again: “Extensions” and “Template Manager”. Click on the star that you can find next to the name of your template. Your new template will be set as default.